Rabaul with the dark cone of Mt Tavurvur on the horizon. 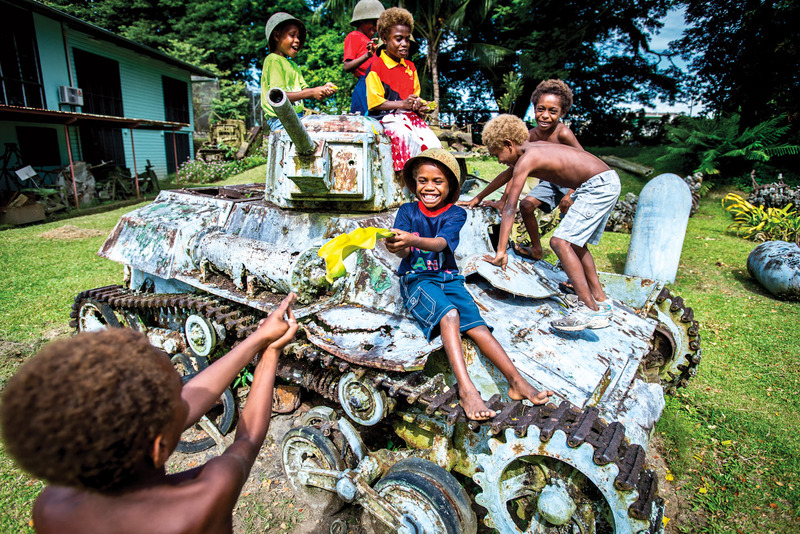 Kids playing at the Kokopo War Museum. 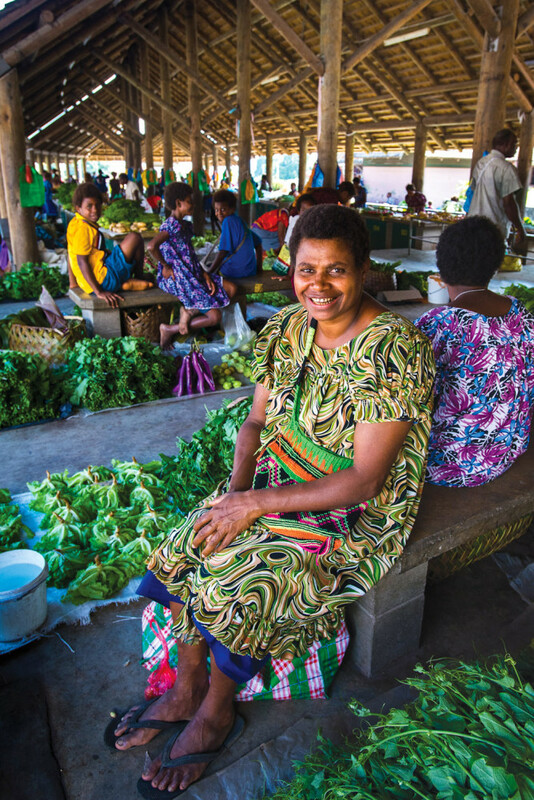 Villagers sell fresh produce at the market in Kokopo. 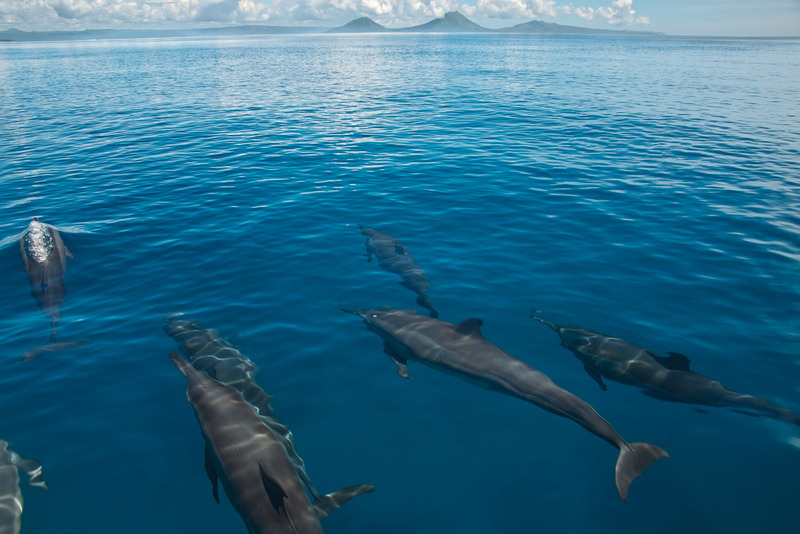 Spinner dolphins play with boats in the strait off Rabaul. 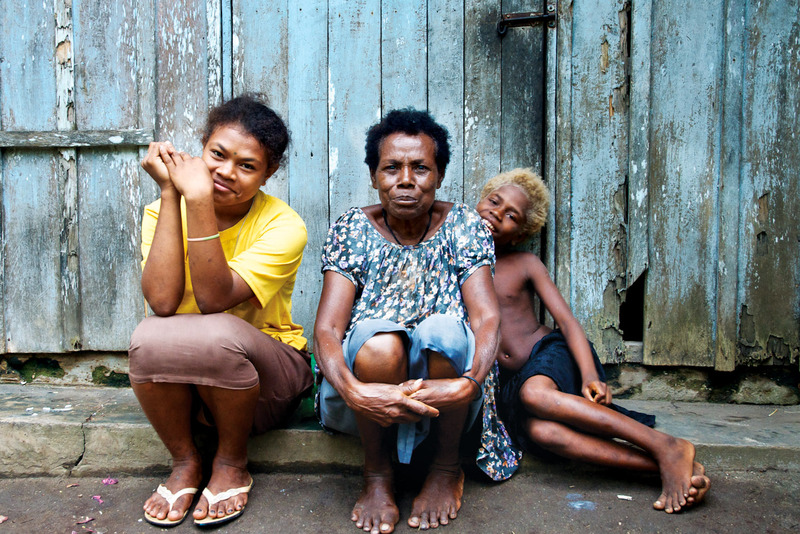 A Tolai woman and her grandchildren outside their Maira home. 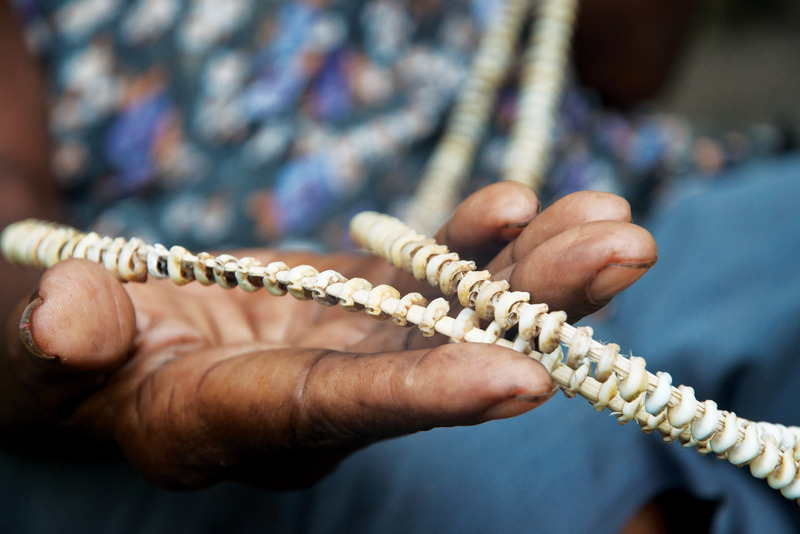 Shell money is still used in East New Britain. Singing and dancing in Maira after the statue of Mary has been moved. Messing about with betel nut in Maira. Mt Tavurvur from a volcanic ash landscape where part of Rabaul once stood. Launching from Kokopo Plantation Resort to dive for the day. “I don’t like it when people say Rabaul was destroyed,” says Susie McGrade poking a piece of fresh fish into her mouth with plastic chopsticks. “It’s still there.” After the banquet lunch she shows off her best earthquake-proof rooms and a wartime bunker under the pool before suggesting we visit the new museum in the old New Guinea Club. All blonde hair, high heels and a white linen ensemble, the longstanding proprietor of the still-standing Hotel Rabaul is an unlikely part of the furniture in East New Britain’s gritty former capital. Susie speaks Melanesian pidgin with an Australian twang and dominates a conversation in a way the indigenous people of the area don’t. Yet the steady optimism of this Rabaul native is not atypical, despite the local history I find clearly expressed through faded photocopies on display at Rabaul Museum. Over the last century Rabaul has been at the mercy of foreign forces and natural disaster: occupation and administration by Germany, Australia and Japan; a devastating volcanic eruption in 1937; more bombs received during the Second World War than Pearl Harbor; flooded by a tsunami in the ’70s; and then Tavurvur and Vulcan blew again. Flying in, cabin attendant Kelina Puipui described to me in a softly spoken voice and grim smile how her village, family home and animals were annihilated in 1994. The lava flowed into the sea and the ash covered villages and most of Rabaul. Loss of human life was negligible, but there was enough damage for the island’s largest city to lose its status as provincial capital to neighbouring Kokopo. Yet the locals, I discover, aren’t tripping over the past; people here, like the natural environment, take the shocks and carry on. 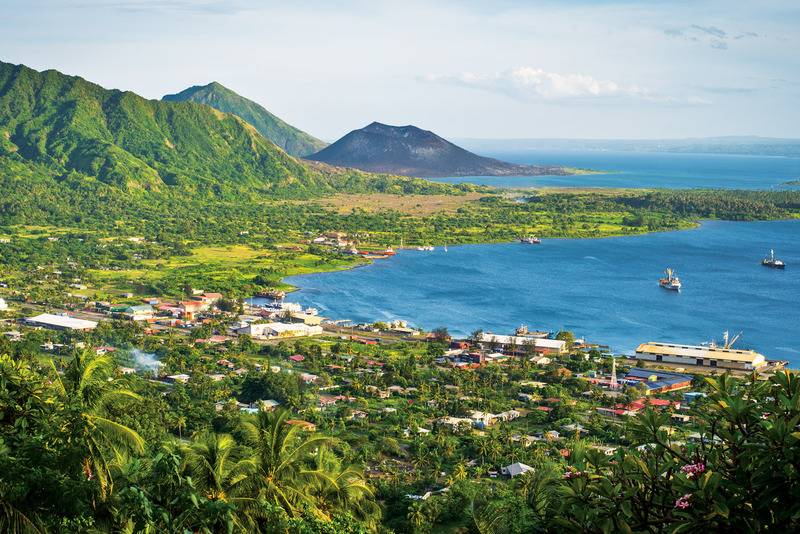 Rabaul itself isn’t particularly aesthetic but its surrounds are beguiling: a deep circular harbour bordered by jungle-green hills and dramatic volcanic features opens out to a protected channel and plant-crammed coral islands. On our way out to the Duke of York Islands we do doughnuts through an enormous pod of spinner dolphins. They flip and fly when our guide, Lawrence Esteves, drums on the side of the boat. We take turns, with mask and snorkel, clutching looped rope off either side of the moving vessel for an underwater view of the frolicking beauties. It beats the hell out of a glass-bottom boat but scores a zero OH&S rating. After some slower self-propelled reef snorkelling, we eat sandwiches on the sandy shore of Kabakon Island. Local people wave back as they paddle past in dug-out outrigger canoes. Kids perch along a nearby branch so I try out my Tok Pisin: “Hai. Yu orait? Wanem nem bilong yu?” And, with shy smiles, Thomas, Mathias and Joshua confirm that the missionary influence persists. 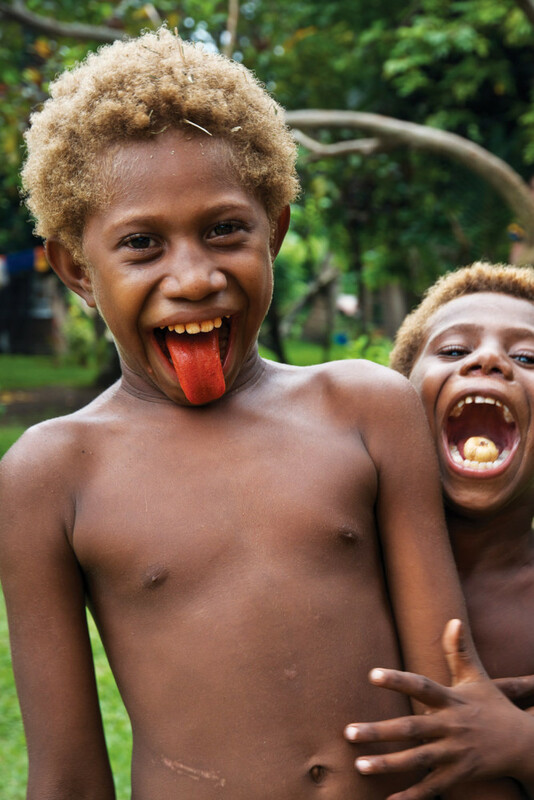 Indigenous people from this part of New Britain are Tolai and Baining. Many generations ago, it’s believed, the Tolai paddled across from nearby New Ireland and pushed the Baining into the mountains. But that’s in the past now too. We’re on our way to an overnight village stay on Mioko Island. The sheltered bay entrance is so tropically idyllic it almost seems artificial. Decorative plants create walkways through the rustic settlement of Maira. There are children everywhere. Our host, Simon Robin, walks us through the school grounds, shows us the best swimming spots and points out where ‘Queen Emma’ rode on horseback between her copra plantations. This Samoan–American introduced coconut to Papua New Guinea in the late 1800s, threw epic parties and “gave herself to the local people”, as Lawrence delicately words it. 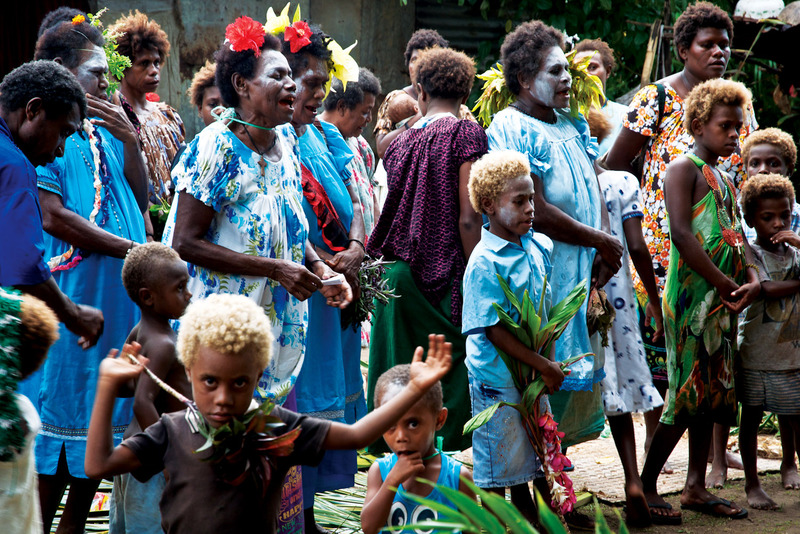 Queen Emma is reflective of the ethnic diversity of Rabaul, then and now. Lawrence’s grandfather was transported here from the Philippines as a Japanese POW; Chinese and Indian indentured labourers were brought in; and one of Susie McGrade’s grandfathers was a Scottish prospector. An afternoon in Maira passes easily. People go about their business but are quietly curious about us. A woman with bright red lips and gums offers me betel nut when I show interest; the triple espresso effect lasts as long as I chew. We’re invited to witness the ceremonial movement of a statue of Mary to another part of the village, which turns out to be quite a song fest; the adjoining neighbourhood has a chocolate wheel on the go. Later, while we’re swimming, a coffin is brought ashore and received by a wailing crowd. After dinner some children spontaneously sing their national anthem and take turns touching my strange, straight hair. We sleep on mattresses under mosquito nets in a newly constructed bamboo building. There’s an outhouse and a splash bowl but no hot or cold running water. Maira comes back to life well before sunrise and, in the growing heat of another humid day, I listen to the milieu: voices, a baby’s cry, a rooster’s crow and lids against pots. When it’s light, I walk through the village to sit with women I’d met the previous day. They tell me about being Tolai, growing vegetables, the gift of coconut. They explain their facial tattoos, split unidentifiable fruit with a machete and offer me the nut inside. They bring out a strand of shell money – still valid currency at market – and show me a Duk-Duk dance performance on a mobile phone. It’s like finally meeting a neighbour – your closest neighbour in fact – who you’ve only seen in the distance and built judgements about until you finally pop over for a chat and then can’t believe you didn’t make the effort earlier. I’m reminded that news coverage, as opposed to actual travel, encourages us to sweep people and places with the same brush and realise that I’ve spent my life doing that to Papua New Guinea. No community can be idealised, but the only protection I personally need at this time in this particular part of the country are my usual travel smarts and some anti-malarials. On return to the mainland, we take a turn around Simpson Harbour and step off the boat to walk on hardened lava. People do hike Tavurvur, but it’s been a little shaky of late. 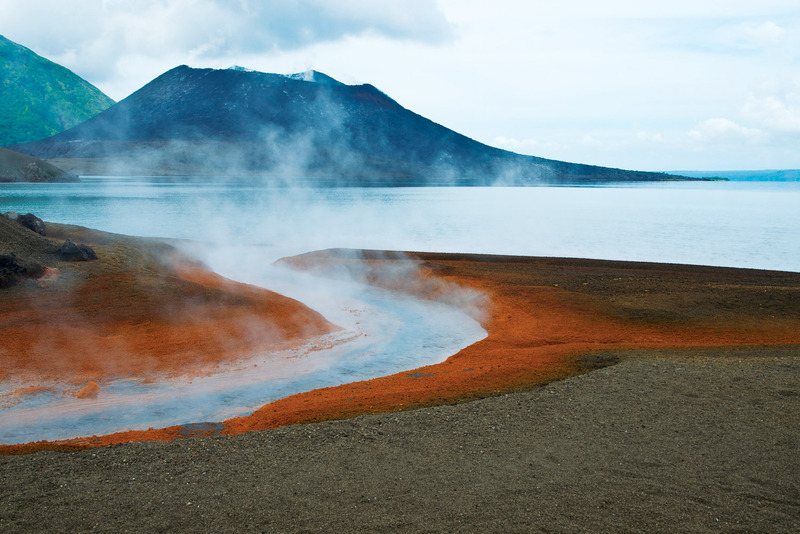 Rabaul caldera sits within the seismically active Ring of Fire, so earth tremors, sulphuric belches and minor eruptions are a way of life. The Baining firedance demonstration that night in the mountains above Rabaul is believed by some to represent volcanic activity, while others say it tells the story of Baining banishment from the coast by the Tolai. Several men, wearing huge haunting masks that represent bush spirits, dance trance-like to the beat of bamboo tubes against a horizontal log and shuffle, one-by-one, into the red embers with only a thin leaf layer covering their soles. The rest of the village watches on and children caught up in the rhythm spin hypnotically in the shadows. It’s hard to believe, watching this scene, that Rabaul was Japan’s main Pacific military and naval base during the Second World War. Though a history tour the next day reveals cold hard proof of the period. Local tour owner and operator, Ellis Waragat, wears a multi-coloured tie-dye T-shirt to show us the Japanese barge tunnels carved into cliffs that house huge relics from the war rusting in the half-dark. Hundreds of kilometres of tunnels run under the frangipani trees and open-air market places of Rabaul, and Ellis walks us down into what was once General Yamamoto’s bunker. Ellis’s tour ends with a drive through Rabaul’s ghostly end for a view of Tavurvur across a sulphuric spring that paints an orange snake through the ash-laden landscape as it streams into the sea. Kelina Puipui is on our flight home, as a passenger this time, having visited relatives for a few days in their ‘new’ village. She’s excited to see me because she’d forgotten to mention earlier that “the soil is really good now for growing vegetables”. In Rabaul there’s always a positive to be had. 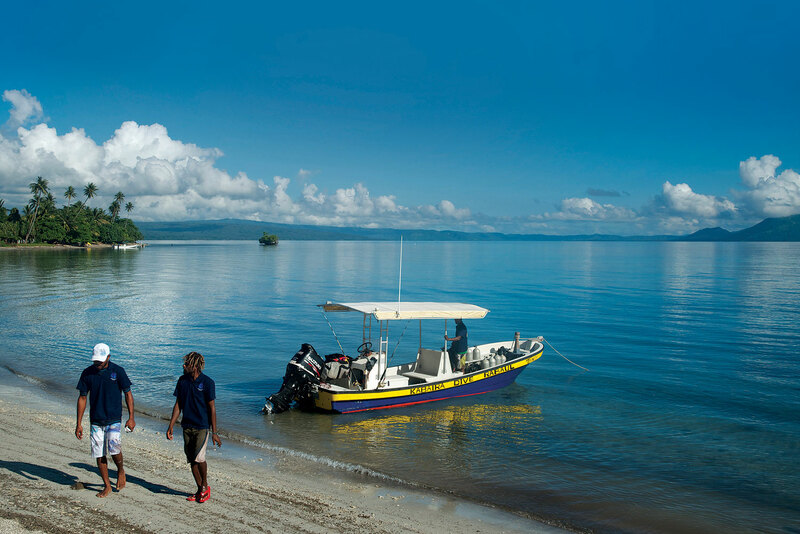 Air Niugini flies to Rabaul from Cairns, Brisbane and Sydney via Port Moresby on select days of the week. is a recently refurbished waterfront hotel in Kokopo with poolside bar, restaurant, dive shop and views of Tavurvur. • East New Britain is a malarial area, and your hepatitis A and B, and typhoid vaccinations should be up to date. • It’s not advisable to drink the water; buy it bottled or take a filter.